Founded in 1997 the Pacific Institute of Culinary Arts (PICA) is Vancouver’s Premier Culinary Centre. This accredited, private and co-educational culinary institute provides students with world-class training in a setting filled with both cultural and recreational opportunities. PICA offers everything from casual classes to wine programs, an award winning Bistro 101 Restaurant & Bakery 101 Café, a wide array of corporate events & catering, and a Professional Diploma Program. 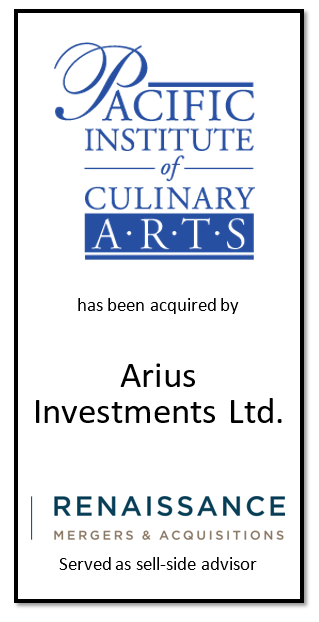 After a robust and competitive go to market process the successful purchaser was Arius Investments Ltd. Arius is the investment vehicle for famed Canadian food entrepreneur Yves Potvin who founded both Yves Veggie Cuisine and Gardein. The combination of PICA’s exceptional history of delivering premier culinary training and Yves Potvin’s expertise, industry contacts and resources will undoubtedly lead to tremendous future success. It was Renaissance Mergers & Acquisitions pleasure to serve as the sell-side advisor to PICA on this transaction. 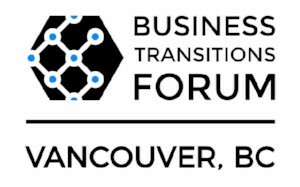 Renaissance Mergers & Acquisitions is an Enterprise Sponsor of the Vancouver Business Transition Forum taking place at the Westin Bayshore Hotel on November 15, 2017. Renaissance’s own Arthur Griffith will be the featured luncheon keynote speaking on the topic of ‘Details Matter’ and Axel Christiansen will be moderating a panel on the topic of ‘Selling Your Business to a Third Party for the Best Price and Terms’. The Business Transition Forum is Canada’s largest event focused on helping entrepreneurs transition successfully. We look forward to seeing you there. As Enterprise sponsors we can offer you an additional 30% off the early bird rates – click here to register now. If you are unable to attend we are always available for coffee! PS. We are also Enterprise sponsors of the Calgary and Edmonton Business Transition Forums – more on that later. We are a boutique M&A firm that specializes in sell-side mergers & acquisitions advisory for small to medium sized companies in Western Canada. We have an experienced, professional team across accounting, taxation, corporate structuring, valuation, finance and deal negotiation…all aimed at helping maximize our clients value upon exiting their businesses. Renaissance Group Mergers & Acquisitions Inc.
tel: 604.629.9600 | fax: 604.629.9601 | web: www.rgroup.caWant to change how you receive these emails?